Bathrooms are one of the most unique rooms in the house, but when it comes to health and safety at home, that’s not always a good thing. An abundance of hard tiles, smooth porcelain, and sleek metal, combined with a lot of water, creates an environment where it’s very easy to slip and fall. Nobody is exempt from the dangers of a bathroom environment, people of all ages injure themselves in the bathroom every year, a figure that is in the hundreds of thousands. A bathroom can be very dangerous, but it doesn’t have to be! Buying a bath mat is one of the least expensive and simplest investments that you can make to upgrade your bathroom. The small purchase can make getting in and out of the shower or bath much safer, and make sure that your feet are dry before you step onto your bathroom tiles or laminate flooring. Most types of bath mats will suffice, as long as the mat doesn’t slide around on the floor of the bathroom. While it’s understandable that you may not want your bathroom to become ‘the room of many mats’, twinning your bath mat with a non-slip mat inside your shower or bath tub is a wise investment. It can get very slippery inside baths and showers, and a non-slip mat will help to make sure that you can stand and move around a lot safer. Slip resistant bath mats will also making getting out of the bath much easier. A step above a mat outside your shower or bath is to upgrade to non-slip flooring. Bathroom flooring is often made from materials that are easy to clean, to lower home maintenance, and materials that are resistant to water damage. Changing to a specialist non-slip material will still mean that your bathroom is easy to clean and resistant to water damage, but the surface will be a lot safer. It’s often not the actual slip that causes an injury but hitting the hard bathroom floor. Grab bars or hand grips are an incredibly effective way to prevent most types of slipping accidents in the bathroom. Bars can be installed anywhere in a bathroom, but they can be most effective in places around the bath or shower and around the toilet, where slipping is very common. There are many design styles to choose from for an aesthetically pleasing bar, so you don’t need to alter your bathroom design too drastically. Shower curtains are more than just a design feature, they’re very important for keeping water inside the bath tub and shower where it’s less likely to cause you to slip and fall. Investing in a quality shower curtain will help to prevent those dangerous little puddles forming just outside the tub that can very easily be slipped on. Being able to see the dangers in your bathroom is one of the best preventive measures that you can take to avoiding them. Good bathroom lighting, that lights up every corner of your bathroom, will help to make sure that you don’t miss any puddles of water or slippery spots on the floor. Good natural lighting and night lights can be just as helpful as the main artificial lighting, so it’s worth making sure that your bathroom windows are unobstructed and even think about investing in a small bathroom night light. A shower seat is a bigger investment than a bath mat, but it’s an essential if you or one of your family members has trouble standing for prolonged periods in the shower. Being able to sit in the shower can prevent a lot of accidents and make showering easier for many people. There are different styles of shower seat available, including ones that easily fold up, so the shower can still be used as a standing shower for other members of the family. 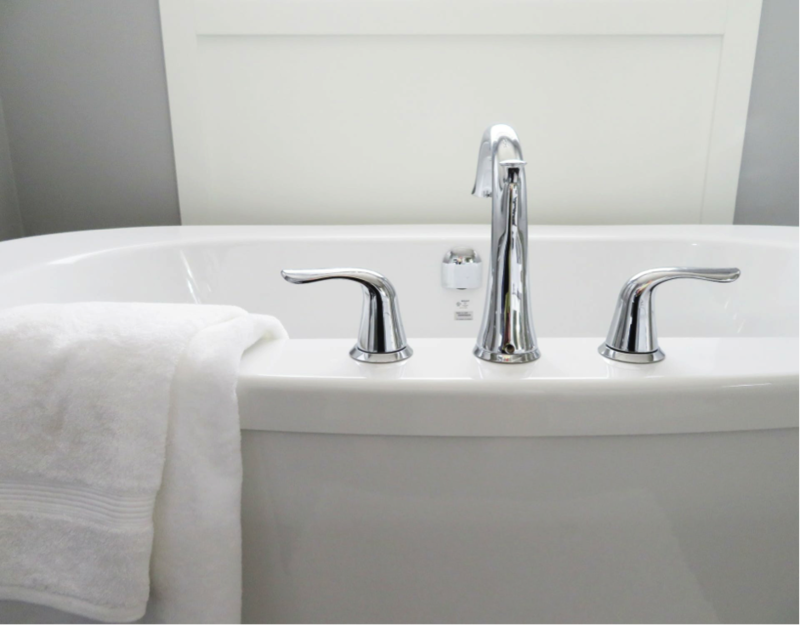 An alternative to a mat inside your bath is to refinish the bottom of the bath tub. There are a range of textured agents available that transform the bottom of the bath tub into a textured surface. These can make the tub surface much easier to grip without having to add a separate mat to the tub. A taller toilet is a brilliant investment for adult-only homes where there is unlikely to be a child that needs to use the toilet. Taller toilets are easier to use and can lower the risk of falling around the toilet area when sitting down or standing up. Many general plumbing services in the Westmont, IL area cover the installation of standard and taller toilets, so you shouldn’t have any problem getting one installed in your home. There is a lot that you can add to your bathroom to make it a safer environment, but there’s also a lot going on behind the scenes that needs to be considered when trying to make sure that your bathroom is as safe as possible. All that plumbing for your shower, bath, sink, and toilet should be regularly maintained as part of your standard home maintenance. Good plumbing home maintenance will help to prevent leaks that can lead to slippery surfaces and pools of water that may go unnoticed. Arranging for a Chicago plumber who provides general plumbing services in your area to inspect your plumbing after any installation, or every now and again, will give you a peace of mind about the general safety of your bathroom. You don’t need to completely overhaul your bathroom to make it a safe part of your home. Just taking on board a handful of the top tips here and getting your plumbing regularly checked, will improve your bathroom and make it safer for the whole family to use every day. You’ve fallen in love with a new apartment or home; it’s everything your heart desires. Except for one thing…it’s got a bathroom the size of a broom closet. You find yourself opening the door, half anxious, half determined, as you imagine a redesign that will bring the petite washroom to life. But where does one begin? Working with a small bathroom presents its own set of design, decorative, and plumbing challenges as you seek to merge functionality and beauty in the same small space. Recognizing some of these challenges, the team at ARCO has outlined a series of small bathroom hacks that’ll help you turn your own small bathroom into one of the most commanding spaces in your home. When it comes to the bathroom, the vanity is typically the focal point of the room, and in a small bathroom, it’s important to find the right model for size and look. If feasible, have a custom vanity built, or search for a unit with some space beneath, a great strategy for holding necessary bathroom items in lieu of closet space and/or shelving. A few trips to your local hardware or furniture store and some online searching will reveal a number of optional heights, depths, and widths that will be perfect for your needs. Like the vanity, there are a variety of sinks that will aid you in your quest for the perfect mix of size and appearance. Common to small bathrooms are pedestal sinks, which only require a few inches of floor space and do wonders for making small bathrooms appear larger. You’ll lose some countertop space, a sacrifice to some, but pair the pedestal sink with a deep medicine cabinet or awesome shelving and charming jars to house everyday bathroom items. If you’re working with an extremely small space, take a page from well-designed restaurants and opt for a wall mounted sink. What you lose in storage, you’ll gain in added space in the bathroom overall. This technique works especially well if you’re designing a guest bathroom that has no need for the additional storage necessary in full bathrooms. Additionally, if your bathroom is ridiculously small, you’ll need to be even more clever in your approach. How about shifting your sink to the corner? There are a plethora of beautiful styles made just for this purpose that are either wall mounted or come with a pedestal or vanity. Of course, with the vanity beneath, you can try an open model that you can leverage for more storage. And for those of you with long, skinny bathrooms, consider a corresponding long and skinny sink that flows nicely with the pre-existing shape of the room. When looking for accent or functional furniture pieces, search for wiry or thin-legged furniture, which takes up less space and contributes to the illusion of more space overall. If you’re lucky enough to build a shower from scratch, try installing an indented shelf within the tiling to remove the need for bathroom shelving that juts out from the tiles. As well, if your shower is exposed, make use of the ledge space looking out to your window: instead of using this space for shower accouterments, add decorative items. When considering toilets, there are a plethora of new, modern styles available. Not only are these newer models beautifully designed, some have slimmer tanks that rise vertically to compensate for the lost horizontal space. You can easily find an inexpensive model to install in your small bathroom and reap the rewards of additional space and striking style. How you leverage shelving will be one of the most important parts of working with a small bathroom. Without a linen closet to rely on, the shelving in your bathroom could be very important. Design and decorate your shelving for beauty and functionality: try something industrial with dark pipes and reclaimed wood, or go with something sleek and modern like painted blocks or reflective surfaces. Once you’ve got those shelves up, try to avoid clutter, which will detract from the aesthetic of the room. Add wicker baskets for an added pop. 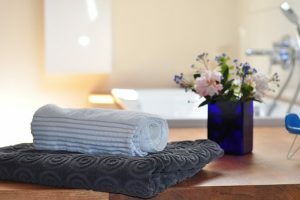 Face your baskets forward and tuck inside rolled towels, the way they present towels in hotels, gyms, and spas. Similarly, if you’ve opted for a vanity with open space beneath, add metal or wire baskets—the look tidies up the storage area beneath and adds a cool industrial vibe so popular in the design space at the moment. Another trick is to use the full length of your bathroom walls when mounting your shelving. Keeping the shelves in the eye-level range can crowd the visual, but if you leverage more height when planning your shelving, the spacing between shelves will give your bathroom the illusion of height. As far as towels go, take advantage of the length of your door. Set a towel rack near the top of the door and another in the middle. With two towels now hidden behind the door, your walls are free for shelving and art. Have you ever walked into a gym or restaurant lined with mirrors and had your eyes tricked by the illusion of added space? Installing a large or long mirror in your bathroom above or across your vanity will have the same effect of making your small bathroom feel larger than it is. Clever use of color plays a big role in highlighting certain details of your small bathroom and contributing to a sense of greater size. For example, opposing color schemes can create an illusion of depth and space. Try pairing together white tiles with dark floors (or the opposite if you’re so bold). The same technique can be beautiful if your bathroom’s walls are halved by a chair rail or a wainscoat. Pair white on the bottom with a darker color up top—maybe a chocolate or beautiful gray—to create a contrast that makes the room look beautiful, dramatic, and more spacious. On the contrary, there’s nothing like an all white bathroom to further the illusion of size. With furniture and bathroom pieces in pure white, it’s difficult for the eye to discern where spaces and shapes end and begin. When it comes using of patterns and color, beautiful and unique patterns in your wallpaper, tiling, and shower curtains can work wonders. Create depth and intrigue with bold tile selections. Consider a stylish backsplash over the sink. Or, try contrasting one large and one small related pattern on your floors and walls to break up a small space. If you’ve still got extra space after shelving, hooks, and tiling, hang art pieces that add pop to the walls or try a set of pieces above your toilet. Now that you’ve got a million hacks for your small bathroom, you’ll want to make sure you welcome the right team to help turn your dream bathroom into a reality. When it comes to vanities, fixtures, plumbing, and showers, keep the team at ARCO plumbing in mind.